Black Label Society Metal Comb - Mad Viking Beard Co.
You are more than a man, you are more than a Viking, you are a Bearded Berserker! You are a metal-head! Have you finally graduated from your wife’s hair brush or wooden combs that just can’t handle the power of your beard? You need a real comb, a comb that matches your soul, you need a metal comb. 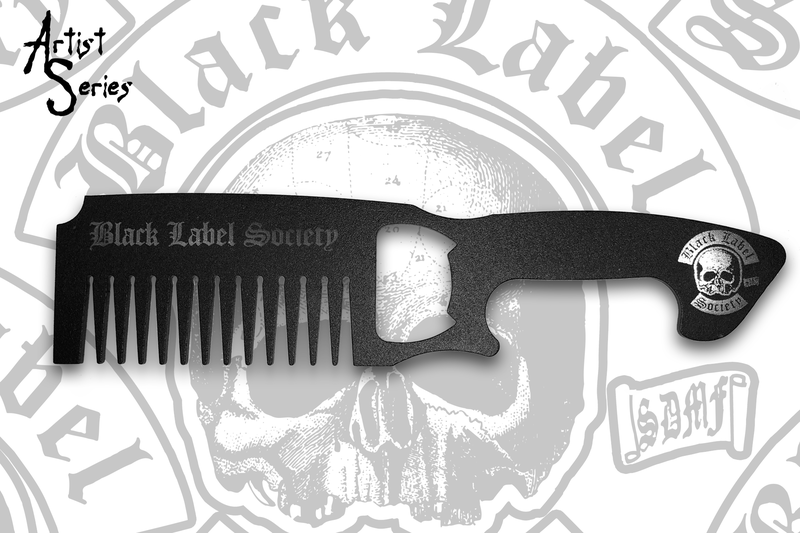 It won’t be just any metal comb, IT WILL BE THE BLACK LABEL SOCIETY METAL BEARD COMB BY MAD VIKING! It’s blacked out stainless steel. It has a bottle opener in the handle, and it has Black Label Society etched into the spine and their logo on the handle! It is the perfect comb for the baddest metal maniacs on the planet! Get yours today! Need more BLS products in your arsenal? Order the oil and balm combo while you’re at it. Want even more? Order the entire BLS Beard Care Kit!